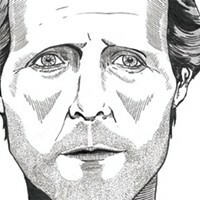 "A trust betrayed," now up for a CAJ prize. Hot on the heels of the Atlantic Journalism Awards making The Coast's day, the Canadian Association of Journalists keeps the party going with its national awards nominations. 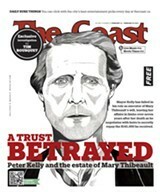 The CAJ's prestigious prizes are for "outstanding investigative journalism in Canada," and one of those outstanding pieces of investigative journalism is Coast news editor Tim Bousquet's February 16, 2012 cover story, "A trust betrayed: Peter Kelly and the estate of Mary Thibeault." The story is competing in CAJ's community newspaper cateogry, going up against "The sad truth: Prescription drug abuse" by Heather Rivers in the Woodstock, Ontario Sentinel-Review, "The Chinging Cycle" by Susan Gamble in Brantford, Ontario's The Expositor and "Activism is in the blood, says tar sands warrior" by David P. Ball Windspeaker. This is The Coast's first CAJ nod since 2010—when Matthieu Aikins was winning back-to-back awards—and the first journalism award nomination for "A trust betrayed" since the AJAs were announced last week [blush]. Other notable nominees on the CAJ's list include "Japan’s irradiated fish worry B.C. experts" by Alex Roslin in The Georgia Straight (shout-out from east coast alt paper to left coaster), local CBCer Nancy Waugh's "Teen in chains" and HRMVotes.ca, a collaboration between King's College and the NS Community College that is up for the Student Award of Excellence. No other media organizations in Nova Scotia were nominated. Please join us in keeping fingers crossed through the May 4 awards presentation.